Create a Custom Screen Now! …with more on the way! And even more! Feel free to take a look at the list and add your own suggestions or vote or comment on existing ones. And as always, please feel free send us a message at contact@dakboard.com with any comments, problems or questions! Brilliant work! I’m going to spend some time playing with a config… however for my house the top/bottom display is ace. I haven’t had a visitor yet who hasn’t spent ages looking at my dakboard! Has anyone experimented with iFrames, and keen to know what you found useful. 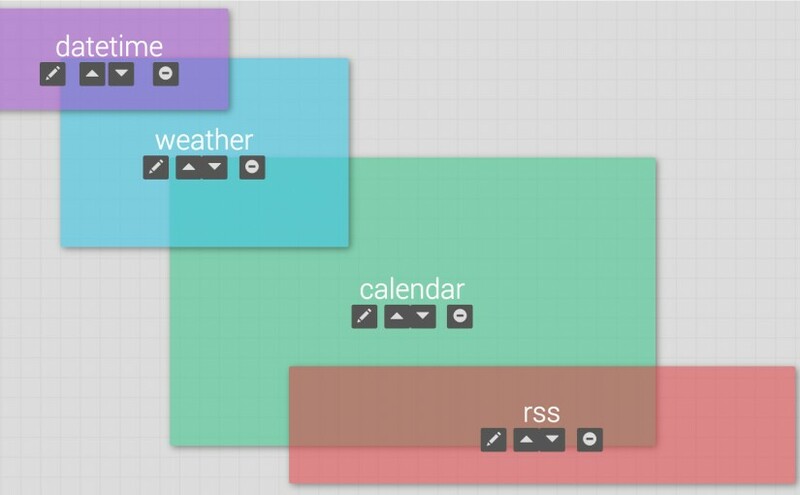 I’m looking for interesting content to add to my DAKBoard layout. Same here, everything I’ve tried so far just gives me a black screen. The black background issue with iframes will be fixed later today. I just worked with Dan to solve a CSS issue that was forcing the background color. Love the custom layouts! It really helps me move some screen elements around to accommodate the way and location where my board is mounted. I’m not yet able to adjust the text on RSS feeds – and since I love to read the news, would love to see an upgrade here. Hi Russel, thanks for the feedback and glad you’re enjoying the custom layouts. We just released a minor update that includes adjustments to the RSS feed text size, alignment and color, so take another look! Love the custom layouts, you won a premium member with that. I am having an issue with iframes though where the page seems to be scrolled a ways down the page when it loads. I have tried messing with the size and the crop to fit feature but it seems to keep happening. This is happening in Chrom/Chromium on my Pi and in Safari on my mac. I am using that iframe to display my home power usage stats via Neurio and my home network stats using the Unifi dashboard for my Ubiquiti gateway. Keep up the great work! Has the ability to scroll through the calendar been added? I’m thinking of going Premium, and will. if that feature is there. Meantime, thanks for all your hard work. I’m building a DIY version, to stick on my refrigerator using some salvaged hard drive magnets. Any way to get a smaller weather widget? I used to have a vertical widget running down the right hand side. The custom widget seems to need a rather large square box and the content layout wastes a lot of space at the top. Even the “compact” setting doesn’t seem to help. Can the feature to edit the color and font of the weather block be added? Is there somewhere a tutorial for custom css? The weather alarm block seems not to work? Next Next post: Nest Integration, Live Video Feeds, Microsoft To-do and More!